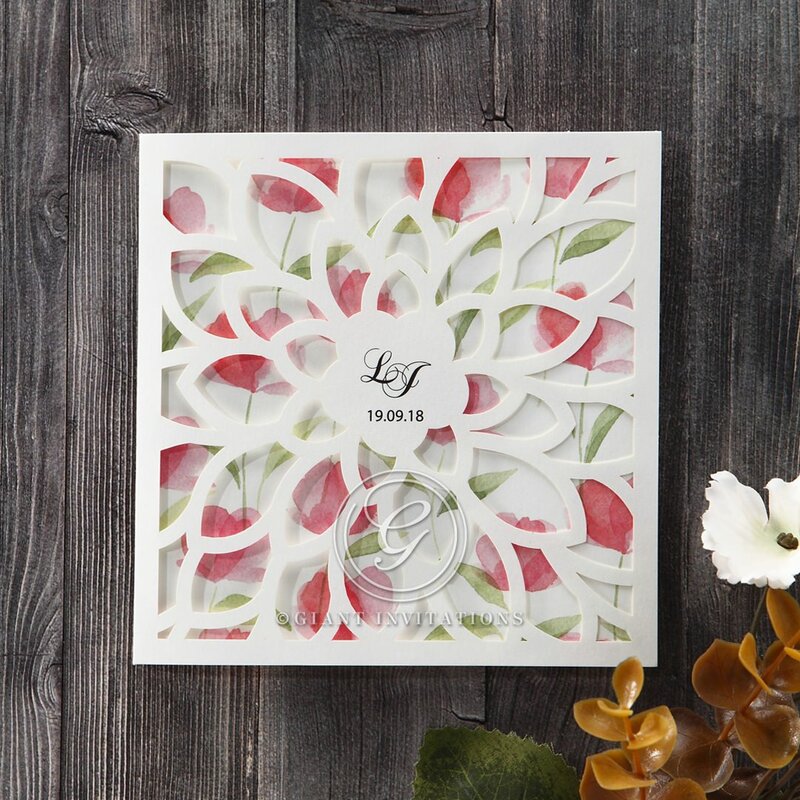 If you are have a garden themed engagement soiree, then this open laser cut floral patterned invitation is perfect for your celebration. The exquisite floral cut out cover allows the water coloured florals digitally printed on the inside to peek through and giving guests the impression that they are peering through a gate to have a glimpse of the beautiful flowers. This tri-fold square invite is modernly styled though dramatic with its design. Once completely unfolded, guests are greeted with your personalised engagement details and love verse in classic typography for a romantic overall feel. My Fiance and I absolutely loved this sample from the minute it came in the mail. The service was fabulous and prompt. The invite itself is very bright, summery and fresh. The card feels like great quality. I particularly like the shimmering envelope insert that came included in the price. There is plenty of space to include all the details of our big day. We will definitely be ordering our final invites very soon! Giant invitation so far is one of the best company I've dealt with. Choosing invitations for my engagement is not easy and so far the service I've been provided is something I would high recommend. Keep up the good work!